Danehill, on the edge of Ashdown Forest, was formerly in the parish of Fletching. A chapel was built in 1835-36 on the site of the present war memorial (1 p1). It was an aisleless brick gothic building, typical of the period, with tower, galleries and a short chancel. The architect was J Cowper (ICBS). A faculty of 1840 for pews and a vault gives its dedication as Holy Trinity (WSRO Ep II/27/50). In 1887 it was damaged by fire (BN 53 p884), shortly before the ecclesiastical district of Danehill (established in 1851 (1 ibid)) was designated a parish, incorporating in addition part of Horsted Keynes. The new church was built at the cost of the widow of Herbert Carey Hardy of Danehurst in the parish in his memory, It was he who had first proposed building an entirely new church after the fire. Though the reasons for the choice of G F Bodley and his partner T Garner as architects (BN 93 p557) is not known, Michael Hall has pointed out (p365) that Bodley’s much earlier church of St Wilfrid Haywards Heath was not far away. Warren (p322) implies that Bodley alone was the architect, but the contemporary reference in BN seems preferable. The new church stands about 120 yards south of the old one and was completed in 1892 in an elegant Decorated, at the substantial cost of £12,000 (KD 1899). It is far from Cowper’s utilitarian work, though the design is restrained, like other late churches by Bodley. Warren placed it among Bodley’s finest late churches, praising ‘the bestowal of thought and care upon every detail’, leading to his ‘usual high finish’ (p326). 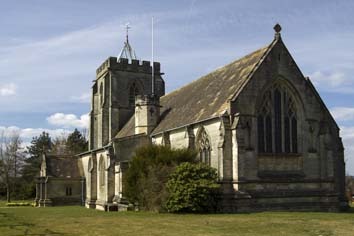 More recently Michael Hall has described it as Bodley’s most ambitious country church since Hoar Cross, Staffordshire, over twenty years before (p363). Though relatively low, its position on an eminence above the road makes it the most prominent building in the village. Built of carefully finished sandstone ashlar, it has aisles, a long chancel and a tower with a short leaded spire, set into the nave on three continuous moulded arches to form a baptistery. The north arcade is continued into the chancel to give access to a side-chapel; on the south side there is blank arcading. The tall arcades are well proportioned, with moulded heads and shafted piers. 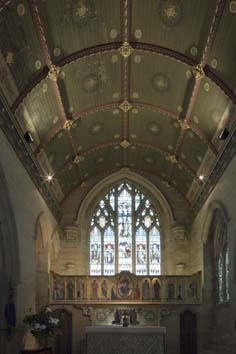 There is no chancel arch, so the roof is continuous over nave and chancel, with Horsham slabs on the part over the chancel, which is ceiled with painted panelling inside. The detail is carefully worked out, whether it be the ballflower on the doorway on the south side of the chancel or the differing tracery of the aisle-windows. Those on the north side, from which the church is normally approached, have considerably more elaborate tracery. 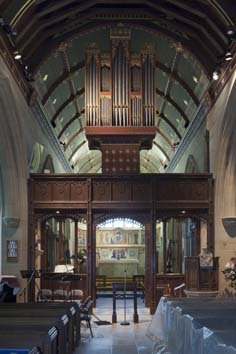 In place of a chancel arch there is a screen with the organ on top, both of which formed part of Bodley’s design. With the other fittings and glass (see below), it gives an opulent air to the dark interior. Font: A handsome piece with a plain octagonal black marble bowl on white shafts. 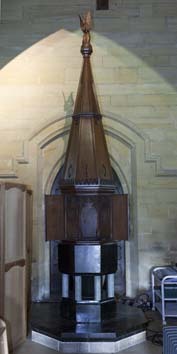 Font cover: Tall and conical, it is surmounted by an angel. It has doors for ease of use. Glass: An almost complete set by C E Kempe. 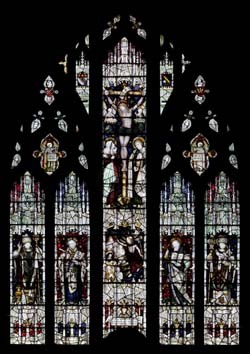 Most windows date from between 1892 and 1904, starting with the east window, and much of it shows a use of plain glass quarries not normally found in Kempe’s work at this time. Michael Hall (p268) suggests that this was due to Bodlay’s influence, though by the time of three additions in 1916, for which Kempe and Co were responsible, such quarries were quite normal in the company’s work. Monument: (North chapel) Captain Ronald Hardy (killed in action 1918) by M Watts (BE(E) p323), after a painting by her husband, G F Watts. A standing white marble figure beneath a canopy. Reredos: Sir J N Comper, 1935 (CDG June 1935 p258) in memory of Mrs Hardy. Stretching right across the east wall, it is painted and gilded and though a later addition, matches Bodley’s work. Screen: Part of Bodley’s design, it has broad cusped openings, with the organ above. This is a feature rarely found in parish churches, as opposed to cathedrals. War memorial: (under screen) C G Hare, Bodley’s close collaborator and successor), 1920 (Hall p366).